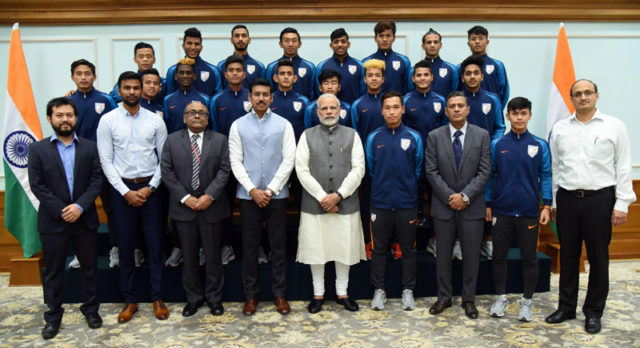 The Prime Minister, Shri Narendra Modi in a group photograph with the Indian Team that participated in FIFA U-17 World Cup, in New Delhi on November 10, 2017. The Minister of State for Youth Affairs and Sports (I/C) and Information & Broadcasting, Col. Rajyavardhan Singh Rathore is also seen. New Delhi: The Prime Minister, Shri Narendra Modi, today met the Indian Team that participated in the recently concluded FIFA U-17 World Cup. During the interaction, the players talked about the experience and exposure that they gained during FIFA, both on and off the field. 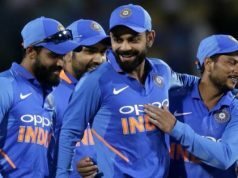 The Prime Minister encouraged the players to not feel disappointed with the outcome of the tournament, but to treat it as a learning opportunity. He said competing with enthusiasm and spirit is the first step to success. 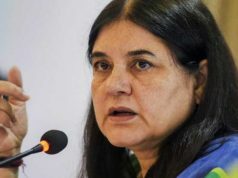 The Prime Minister said India can achieve a lot in football. He also mentioned that sports helps in developing personality, building confidence, and in overall development. Minister of State (I/C) for Youth Affairs and Sports, Shri Rajyavardhan Singh Rathore, was present on the occasion.